OS Grid Reference: ST5484 9002. On a tiny island in the Severn estuary about half a mile south-west of Beachley, near the Severn bridge, stands an ancient ruined chapel that was originally dedicated to St Tecla (Treacla) and, later to St Triog, Rioc or Twrog. 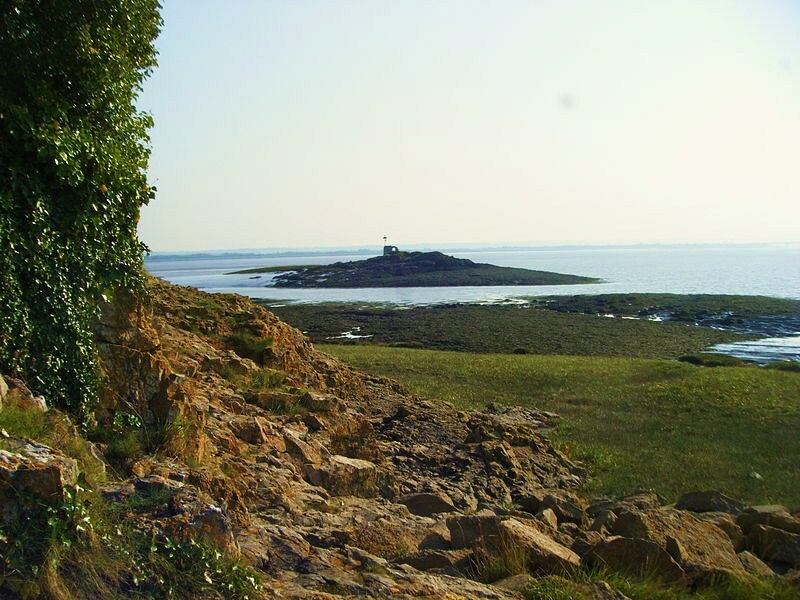 The island called Chapel Rock is frequently cut off by the dangerous tidal waters of the estuary and access can only be had when the tide has gone out. The ruined chapel, now only a few walls and an archway, dates from the 13th century, although there was a older chapel on this site back in the so called ‘Dark Ages’. Inside the ruins there is a holy well that was once well-known for its healing properties. In the 1540s the chapel was abandoned and left to crumble away, the people were now fed up of having to wade across the estuary and sometimes even having to stay on the island for many hours when they were caught out by the fast, incoming tides. Little is known about St Tecla who was, according to legend, a 4th-5th century princess from Gwynedd, north Wales, and daughter of an unidentified Romano-British king or chieftain called Requli or Reguli. St Tecla became an anchoress on the island after abandoning her father’s court in order to seek a religious life, but she was later murdered in her cell by sea pirates. She is probably the same saint who has a couple of churches dedicated to her in mid and north Wales (Llandegley), but her name has often been confused with a 1st century female saint called Thecla, who was a follower of St Paul the Apostle. In the 6th-7th century her cell was used by another Welsh saint called Triog or Twrog and it was he who kept a beacon burning on the island to warn sea vessels of the dangerous rocks (known locally as Chapel Rocks). Today a more modern solar-powered light house stands on the island. But there was a 6th century St Tecla or Tecychius, who was a disciple of St Tatheus (Athan), according to author Bryan Walters, in his work ‘The Archaeology And History Of Ancient Dean And The Wye Valley’. So could the tiny island chapel and its holy well be dedicated to this saint? Barber, Chris., Mysterious Wales, Paladin, London, 1987. Barber, Chris., More Mysterious Wales, Paladin, London, 1987. Categories: Ancient Churches & Chapels, St Tecla's Chapel | Tags: St Tecla's Chapel at Beachley in Gloucestershire | Permalink.